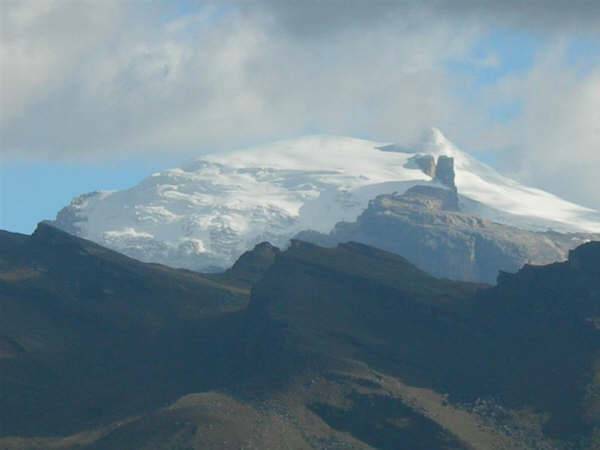 According to Colombian legend, the snow-capped mountain known as the Sierra Nevada de Santa Marta was created at the centre of the world, and at the beginning of time, by Shibalauneuman (the Mother of All Things). Located at the northwestern tip of South America, in the Republic of Colombia, only 42 km from the shore, the peak of the Sierra Nevada reaches 5,775 meters (18, 948 feet) above sea level, making it the highest coastal mountain in the world. Centuries ago, the Sierra Nevada de Santa Marta was a place where diverse human groups flourished; one of them, the Tayrona civilization, reached the highest level of development without deteriorating its environment. The European conquest destroyed that nation; today, all that remains of the Tayrona peoples are some gold, stone and shell carvings, and the intricate lithic (rock) pathways they carved into the landscape to link hundreds of their ancient towns and city-sites to terraced farms and water sources. The mountain is now inhabited by aboriginal communities that proudly preserve their complex religious, social and political societies. The Sierra Nevada de Santa Marta is one of the world’s most important ethnic, ecological, archaeological and cultural patrimonies, and is internationally recognized as a ‘Man & Biosphere Reserve’. Its environs are typical of tropical America, containing an extraordinary variety of climates and habitats with great biological diversity. Its fauna and flora are abundant and several of its species are to date still unknown to science. Vancouver-based Colombian photographer, naturalist and educator Diego Samper, who has lived in the Sierra Nevada, has worked with the Museum of Anthropology to create an exhibit, and unique public programming, focused on the living cultures of ancient lands, issues of sustainability and the complex continuing relationship of indigenous peoples to the land. The 26-panel exhibit of images, words and soundscapes offers rare insight into aspects of a country so often overshadowed by news reports focusing on drugs, corruption and social decay. It also gives us an opportunity to learn more about the crucial role of the photographer as cultural and historical documentarian. This entry was posted in Art, Museum & Gallery Exhibits, Environment & Nature, Photography and tagged biosphere reserve, California, Colombia, Diego Samper, european conquest, fauna and flora, Man & Biosphere Reserve, Mother of All Things, Museum of Anthropology, rock pathways, Santa Marta, Shibalauneuman, Sierra Nevada, Sierra Nevada de Santa Marta, South America, stone and shell carvings, Tairona, Tayrona, United States, University of British Columbia.